Red Leather Books, LLC, 9780991431014, 104pp. Lexi is not a fan of Christmas hoopla. It's loud like an explosion, and it makes her insides hard like an ice cube. Too bad a big, fat holiday party at school is breathing down her neck. 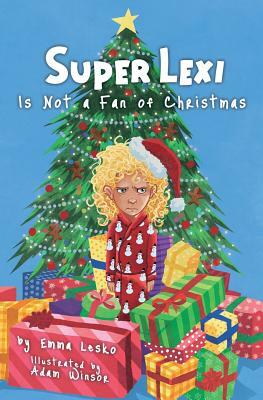 Now, to get out of it, Lexi has to get on the naughty list. Only one problem: Breaking rules gives her the feeling of barf. Emma Lesko grew up near Detroit, Michigan, where she ate dirt, taught her guinea pig to turn the basement lights on with his teeth, and read books in a garbage can. Like all kids, Emma had some superpowers. She had supersonic ears, super-strong taste buds and a super-smelling nose. Sometimes her superpowers were spectacular, and sometimes they gave her a feeling of barf. Though Emma has written a gazillion kids' stories, this is the first one she ever showed anybody.